The New Jersey Vietnam Veterans’ Memorial and the Vietnam Era Museum & Educational Center are companion projects that complement one another. The Memorial honors the sacrifices made by New Jersey residents who gave their lives while serving in Southeast Asia and, at the same time, pays tribute to all who have served. 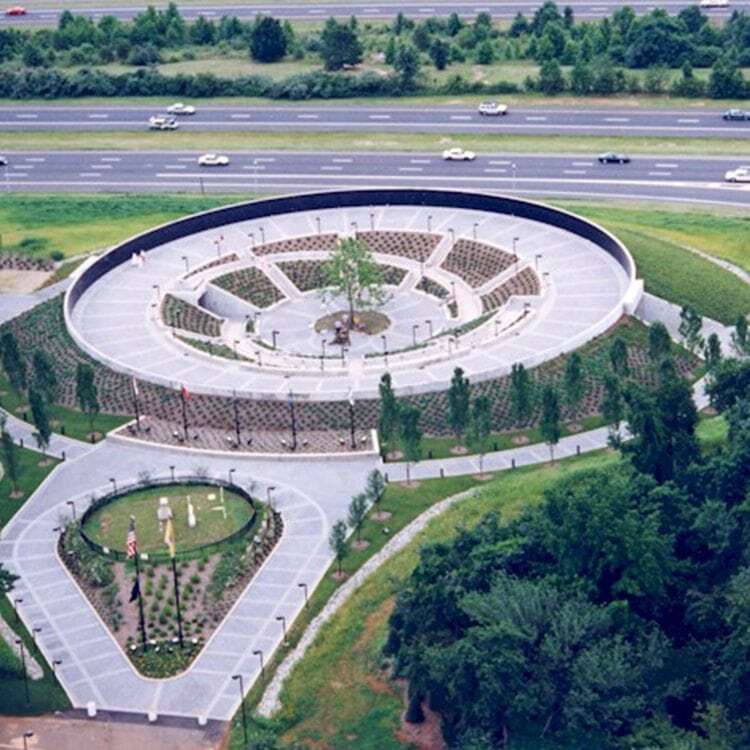 The idea for the New Jersey Vietnam Veterans’ Memorial had its beginnings on Veterans Day, November 11,1982. A contingent of New Jersey veterans attending the dedication of the Vietnam Veterans Memorial in Washington, D.C. realized the need for just such a memorial in the State of New Jersey. Working with state legislators, veterans and community groups, and individuals too numerous to list, they saw the process begin to take shape over the next 3 years. On January 21, 1986, Governor Tom Kean signed into law the bill that created a 14 member New Jersey Vietnam Veterans’ Memorial Committee. The committee’s charter was to select a suitable location for the construction, conduct a competition for the design of a memorial honoring New Jersey’s veterans of the Vietnam conflict, determine methods of financing the construction, and to initiate fundraising. Included in the bill was a one-time grant of $25,000 to fund the design contest. In the spring of 1986, the committee selected the 5.5-acre site on the grounds of the Garden State Arts Center in Holmdel, Monmouth County, from a list of 6 possible sites from across New Jersey. Dedication ceremonies were held at the site in the spring of 1987. A design contest was held from the spring of 1987 to the spring of 1988, drawing over 400 entries that were judged by a select panel of experts from the arts, historic, and Veterans communities in New Jersey. On July 7, 1988, the design submitted by Hien Nguyen, a refugee who left South Vietnam thirteen years earlier, was unveiled. Hien’s design contains a 200-foot diameter open-air pavilion, inside of which are 366 black granite panels. The New Jersey Vietnam Veterans’ Memorial Foundation was created and incorporated under the laws of the State of New Jersey as a non-profit organization in September 1987 to assist the committee in building the Memorial. The Memorial Committee was later dissolved. Groundbreaking ceremonies were held at the site with Governor Tom Kean on May 7, 1989, with veterans groups, family members, and state and local officials in attendance. It would take another two and half years until sufficient funds were raised to start the initial phase of the Memorial’s construction. During 1990-1991, design concepts were solicited from New Jersey’s sculpting community for the three statues included in the memorial design. The work of Thomas Jay Warren, formerly of Trenton, was chosen and unveiled at ceremonies in the State House Annex in Trenton, in May 1991. 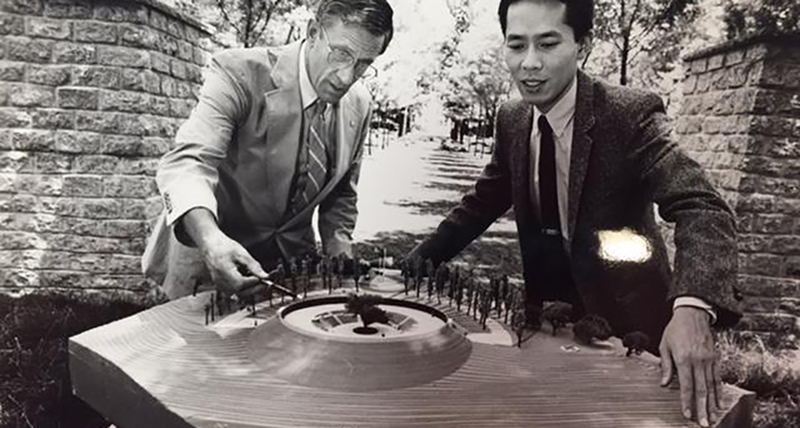 The first phase of construction began on November 19, 1991. Ceremonies on that day were attended by Governor Jim Florio and hundreds of veterans and family members, all of whom witnessed a bulldozer’s first cut into the earth. 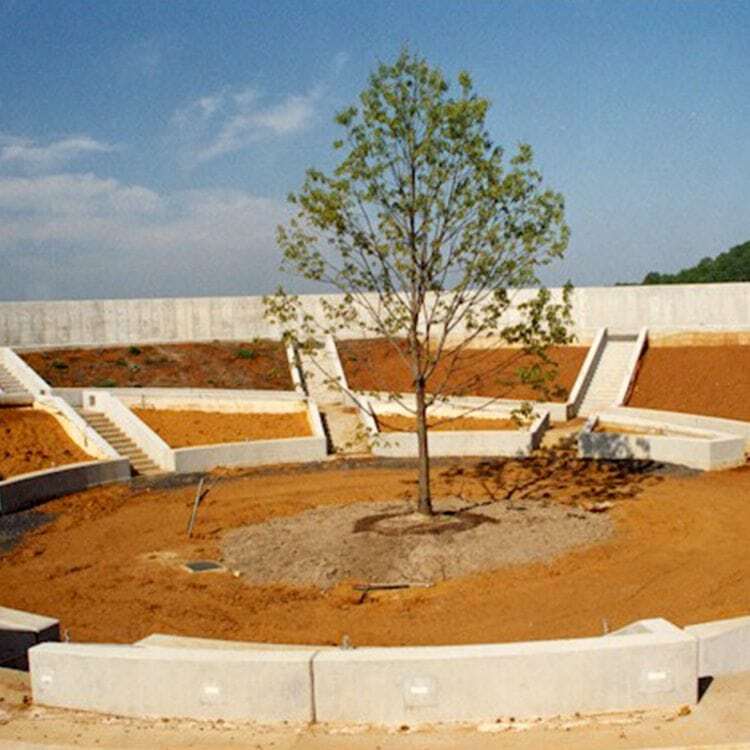 This phase would see the excavation of thousands of cubic yards of earth, the pouring of 1,000 cubic yards of concrete for the memorial’s foundation, inner structure and the outer ringtail, and the beginnings of initial landscape work. This first phase of work continued through 1992 and 1993, stopping only during the winter months. The various construction phases of the Memorial lasted more than four years. As new money was raised to support the construction, another phase of the Memorial was completed. Finally in the fall of 1994, the final phase of construction began and a target date of May 7, 1995 was set to coincide with the 20th anniversary of the end of the war.